Sony has fallen way behind Fuji in the APS mirrorless race now. When Canon and Nikon decide to jump in they know they will quickly fall to the 5% they are at in the DSLR sector. 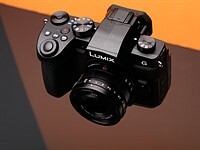 Based on the last worldwide statistics available (november), mirrorless marketshare has remained about flat in units (19%) year over year with a slightly larger drop (3 % point) in unit shipments, but with a smaller drop in actual value of shipments (again by 3% point), the latter being more of interest to camera makers. Interestingly, the last month shows that mirrorless is regaining ground with an 18% month over month increase of unit shipments vs 15% drop for DSLR's. And a 59% increase in shipments value vs 9% drop for DSLR's. Yeah, that sells a lot of cameras. "buy our $2000 camera and learn to focus it yourself!". I am sure we will see plenty of those at the Olympics. Maybe this is why mirrorless sales are plummeting and DSLR sales are doing so much better. Maybe you're making up things again, see above. 3 My ILCE-6400 is in Chinese, no way to switch it to English? 2 A6000 w/ 10-18 & 18-135. The perfect travel combo.